The Moon – friend or foe? Whether or not you like the Moon depends on your interests as an astronomer. That’s because its brightness tends to overcome the fainter objects, such as nebulae and galaxies, which go by the general name of deep-sky objects. But for planetary observers it’s no real problem at all because the planets are bright enough to shine through moonlight and even light pollution. And there are many people who are fascinated by the Moon itself. As you know, the Moon goes through phases, caused by the changing illumination of the Sun as the Moon goes around the Earth. 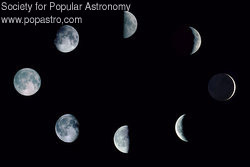 The sequence begins with a crescent Moon in the west after sunset, then after a few days we see the half Moon. The illuminated part gets fatter every evening, and the brightening Moon starts to wipe out the fainter objects in the sky. By full Moon it rises just as the Sun is setting, opposite it in the sky. Following this, the Moon rises later and later until for a couple of weeks it’s out of the evening sky altogether, and you can only see it in the early morning sky. These evenings are the best time to do your deep-sky observing. 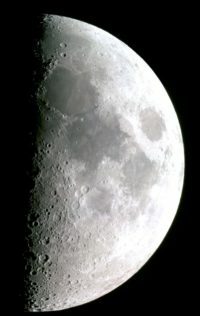 The best time to view the Moon is when the shadow line, or terminator, is well displayed, such as around half Moon. Then you can see the mountains and craters thrown into sharp relief, and they are at their most spectacular. The worst time is around full Moon, because then all you can see are vague lighter or darker patches. Learning your way around the Moon works the same way as learning the sky. Use a Moon map to pick out one feature, such as one of the darker “seas” (not seas at all, but actually darker plains), then work from there to the others. The areas around the seas are easiest, because there are fewer craters, but the light areas, known as lunar highlands, are a jumble of craters and it can be hard to tell one from another. Ideally, you should observe every evening, starting with a crescent Moon, because the changing phase very helpfully reveals a new section each night so you can build on your previous evening’s knowledge. But with the British climate being what it is, you’ll probably have to make the best of odd nights when you can. We have a special Moonwatch area of this website where you can find out lots more about the Moon and how to observe it.